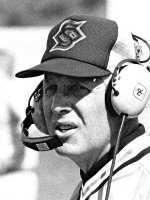 Professor Emeritus of Physical Education Tom Porter '51, a highly regarded coach who led the St. Olaf football team for more than three decades, died January 24 at the age of 83. Porter, a member of the St. Olaf Athletics Hall of Fame, was the head football coach from 1958 to 1990. During that time, he led the Oles to eight conference championships and the school's only trip to the NCAA playoffs. He co-authored a book, The Greatest Game: Football at St. Olaf College 1893-2003, with Bob Phelps, and the fieldhouse adjacent to Manitou Field was named Tom Porter Hall in his honor. Aside from his football duties, Porter coached baseball, track, and hockey during his tenure at St. Olaf. Read more about his career and impact on the campus community at St. Olaf Athletics. A celebration of Porter's life will be held Tuesday, January 29, at 2 p.m. at St. John's Lutheran Church in Northfield. Visitation will be Monday, January 28, from 3 to 7 p.m. in the Black and Gold Ballroom in Buntrock Commons at St. Olaf. Visitation will continue at the church on Tuesday one hour prior to the service. Contact Kari VanDerVeen at 507-786-3970 or vanderve@stolaf.edu.